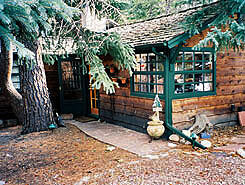 The Swiftcurrent Lodge is small in size but huge in personal attention. We have 12 units in the summer, 6 in the winter. The advantage of being small, bordering Rocky Mountain National Park and being on the river gives one the sense of seclusion and offers a quiet, peaceful atmosphere. With these attributes plus your own custom package, the Swiftcurrent Lodge is the ideal location for your Romantic Getaway. Everyone needs to escape now and again. Come gather your peace, relax and enjoy a romantic rendezvous. Spend enchanted evenings cuddling by a crackling fire or soaking in your private hot tub or Jacuzzi. Valhalla Resort is the ideal Estes Park lodging location from which you can walk into Rocky Mountain National Park, take in the tranquility and see the wildlife. We’re just 10 minutes from downtown where you can explore unique shops and Galleries or indulge yourself with a delicious lunch or dinner. Welcome to Valhalla Resort, a charming piece of paradise! 4 units with everything you can possible need (and more) for a wonderful stay! ALL overlooking Big Thompson River. �Ever After" is a small romantic cottage full of personal touches, a gas fireplace, and private hot tub. The largest unit "Never Leav'Inn� ( 1100 Sq ft, sleeps 4 ) and has a 70 ft. riverfront private deck & hot tub, wood burning fire place, full kitchen. "Kozy Kove" has a path leading around back to a private & romantic setting, kitchen fully equipped, private hot tub and deck, for 2 right on the river. Small weddings available see web site. Our newest location is 2 miles from town, one bedroom, full kitchen, all new, covered balcony with grill and river to enjoy. We invite you to Wildwood Inn where you can experience the beauty of the majestic surrounding mountains, the abundant wildlife away from the congested areas of Estes Park. Nestled within 7 acres of private land and the National Park, you will enjoy spectacular views, and star studded nights that can let your spirits soar. Indulge yourself in beautifully appointed suites all with luxurious 310 thread count linens and some with Deluxe Temper-Pedic mattresses. Most offer private outdoor hot tubs with spectacular views of the mountain ranges or fireside hot tubs with shimmering candles aglow, and even ones with both. Reserve time in our relaxing and rejuvenating sauna and sun room as well as indulge in a treatment at our beautiful Day Spa. Windcliff is a distinctive mountainside view neighborhood featuring fully furnished vacation homes and condominiums. Located on 240 secluded acres on the sunny side of Ram’s Horn Mountain, and just minutes from Estes Park, each home has spectacular views of Rocky Mountain National Park and the Continental Divide. Your home is fully furnished and equipped, including fireplaces, full kitchens, decks, washer and dryer, microwave, cable TV, linens and towels, and of course a breathtaking view! Bordering Rocky Mountain National Park, and Roosevelt National Forest, you can hike right into the National Park from several Windcliff homes! Explore, hike and fish with your whole family (and pets) or relax and romance with a loved one from a private patio with built in firepit directly on the South Saint Vrain River in Colorado's incomparable Roosevelt National Forest. A cozy Hansel and Gretel style cabin with a separate bunkhouse. A dream come true for those who discover its peaceful and healing quality year round. Central to boundless amenities. 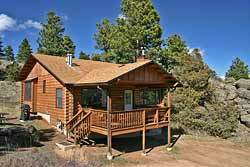 Roomy 1,000 square foot cabin, with stone fireplace and a woodburning stove in the master bedroom with private half bath. The second bedroom adjoins a full bath. 1-10 people. Third virtual bedroom plus bunkhouse. Free Wireless WiFi. A stay at Aspen Winds provides opportunity to experience the Rockies’ splendor as you’ve only imagined possible. The cool, rushing waters of Fall River provide frontage to Aspen Winds where deer and elk wander freely through the aspen, spruce, fir and pine trees. The spacious, luxurious spa suite is perfect for the romantic get away. This suite includes a pillow top king bed which faces the gas fireplace, TV, VCR/DVD, spa Jacuzzi for two, leather love seat, private deck 25 ft from Fall River and a breakfast bar with microwave, coffee maker, toaster, and a small frig. Add a special occasion package to enhance your stay. Sit on your Private patio or deck overlooking Fall River. Cook on the gas grille or make use of your fully equipped kitchen. Enjoy modern, log accent, custom furniture and tasteful decoration while relaxing on your Estes Park vacation. Bear Paw offers one, two and three bedroom units, each bedroom having a private bath. You will really enjoy the full sized refrigerators and ranges, dishwashers as well as washer and dryer in all units. Of course the dishes and utensils are provided. Each unit also boasts a television with DVD and VCR (TVs also in each bedroom). Complimentary wireless internet is available to our guests. 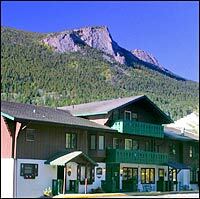 We are ideally located between downtown Estes Park and the north entrance to Rocky Mountain National Park. We�re open all year to host your stay. Romance and activity packages available. Welcome to the very romantic world of Della Terra...located above Estes Park at the Fall River entrance of Rocky Mountain National Park. The Chateau rests at the top of the wooded acreage, surrounded by untouched nature. Della Terra offers fourteen luxury suites,a lodge room with three-sided stone fireplace and waterfall, private spa treatment room, dry heat sauna, library, theatre room, styling salon, and espresso bar. Each suite features a see-thru fireplace, private balcony with 2 person hot tub, sitting nook with arched window, soaking tub before a romantic water feature, walk-thru jetted shower. Our suites are designed to celebrate and embrace the earth's elements, the seasons, or the skies. Where your Rocky Mountain Adventure begins! Our conveniently located, 1910 rambling mountain inn is snuggled in amidst towering pine and aspen with an expansive view of the Estes Valley. The inn consists of four luxury suite, all with private baths with fireplaces and whirlpool tubs for two. Two luxury cabins sleep up to six and have a full kitchen. A gourmet breakfast is included in the price of suites and cabins. A great room and sunny family room offer games, piano, movie library, trail guides and maps. The warmth of knotty pine walls, wood floors, a big sandstone fireplace and family heirlooms transport you back to a simpler era. Let us pamper you for your romantic getaway, elopement or any occasion when you chose Estes Park. The Historic Dripping Springs Resort sits along the riverbanks under ponderosa pines and quaking aspens, conveniently located just minutes from Estes Park. 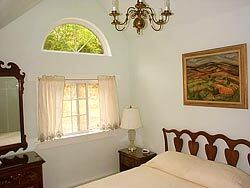 Whimsical rooms and cabins with country gourmet breakfasts are our signature. Couples enjoy romantic nights and walks along the river walk. Seek the bubbling hot waters and have champagne toasts in your private outdoor hot tub and have a soothing massage or steam sauna by the river. Natural setting with Rocky Mountain hospitality. Elopements, romance packages, weddings, and any special occasion, our hideaway in the forest is the perfect spot for you. Mountain Shadows Resort features couples cabins with private hot tubs, king beds with luxury bedding, kitchenettes, sitting area with fireplace, double showers, small private decks (the better to enjoy our spectacular scenery) and much more. Superb wildlife viewing! Located just minutes from the main entrance to Rocky Mountain National Park and close to downtown Estes Park. Comfy, cozy and oh so Romantic! "Rustic Elegance" describes our 23 privately owned cabins/vacation homes. At the doorstep of Rocky Mountain National Park displaying some of the most awesome beauty that Colorado has to offer, we accommodate all tastes and budgets from cozy rustic cabins to luxurious mountain homes. 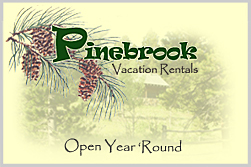 All of our properties are secluded, peaceful mountain getaways with easy access to the park and its hundreds of miles of trails and close to the very popular Estes Park with its many attractions. Our properties come with fully equipped kitchens and all linen is provided. Many have wood-burning fireplaces,WiFi, jetted tubs or hot tubs, washer/dryers, satellite TVs & gas grills. We have recently added guest horse facilities and can now also accommodate groups. Range Property Management is filled with vacation getaways of all sizes, shapes, and descriptions. 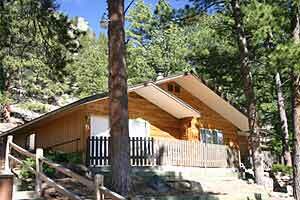 We have a wonderful variety of cabins, condos, and homes in the Estes Park and surrounding areas. We can find the perfect place for your vacation, weather you prefer to walk to downtown shops or stay in a secluded cabin at the end of a mountain road. Come “Home” after a day in Rocky Mountain National Park and enjoy the beauty of the mountains. Located just 30 feet away from the babbling of clear cold mountain waters of Fall River. Yes, fishing is allowed. River Stone has 16 units (1 or 2 bedroom) across the street from the granite and Pine Mountains of Rocky Mountain National Park. You will enjoy beautiful views from inside or outside your unit. All of the units have the same features ... king-size beds, gas fireplaces, two-person spa Jacuzzis, decks with gas grilles, fully equipped kitchens, wireless internet and so much more. Many guests return year after year, and it�s no wonder. 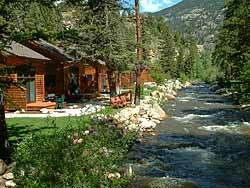 Where else can you find such peace and quiet just minutes from Estes Park or Rocky Mountain National Park. You�ll enjoy your visit any time of year. Romance and activity packages available. River Spruce is a magical place to visit any time of year. You may choose to unwind by the river and enjoy the serenity of the outdoors or enjoy a cozy cabin equipped with all the comforts of home. 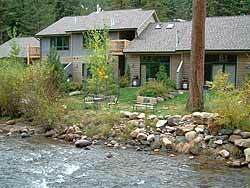 River Spruce is a small cabin resort with cabins right alongside the Big Thompson River. You can walk into the National Park meadows in about 15 minutes and the park is literally across the street. We only have 8 cabins on the property so we are able to provide excellent service. We start your day by bringing fresh baked goodies to your door every morning except Sunday and you may end your day in the cool mountain air sitting in your own private hot tub or around your fire pit roasting marshmallows. Private outdoor hot tubs, riverfront property and no children! Can it get any better? Shelly�s Cottages is an adult only (13 to 113) property so you can leave the kids at home and enjoy a quiet mountain retreat with the one you Love! Reconnect with your better half as you sit next to the river or in your hot tub under a Colorado star filled sky. 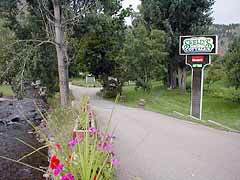 We are conveniently located between Boulder and Estes on 5 acres of green lawns and 900 ft of riverfront property. Enjoy Estes during the day then escape back to the peaceful sounds of Mother Nature at night. No weddings, groups or crowds to ruin your peace and quiet. Please visit our website for rates, policies, detailed information and photos of the property and cottages. Need an escape from the hectic life? Want to surprise that special someone? How about a gift certificate for that memorable occasion. Enjoy the seclusion of Solitude Cabins. Experience the privacy and mountain charm of one of our stand alone luxury cabins nestled among more than 300 trees on 9 acres. Private use of the hot tub allows for tranquil relaxation while listening to the elk bugle or taking in the spectacular display of shooting stars above. Each privately owned cabin is fully furnished with premium quality linens. Let us provide a dinner package to prepare in your upscale, full-sized kitchen. Celebrate your special occasion in the warmth of the cozy fireplace or stand in awe of the majestic sunset on your private deck. Enjoy the luxury of time standing still just long enough to have those special moments that create unforgettable, lasting memories. Let us help you customize your individual Romance Package. Consider Stone Mountain Lodge and Cabins for your Romantic Getaway, Colorado Wedding in the Mountains or Honeymoon on our scenic 45 acres. 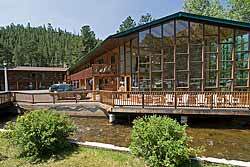 Our Resort is located between Estes Park & Boulder, Colorado. And, nearby Lyons has great restaurants, shops, music festivals and concerts. Year-round lodgings include a historic, romantic 2 bedroom cabin with jetted tub and gas fireplace, a one bedroom cabin with sleeping loft, wood fireplace and jetted tub, plus other cabins and lodge rooms. All non-smoking units have free wireless internet and local phone, fridge, microwave, coffeemaker, cable TV and are air-conditioned. Many units accept pets. Enjoy a hike on the mountain or walk around the pond and take those special photographs. Ask about our romance packages with flowers, chocolates and champagne! 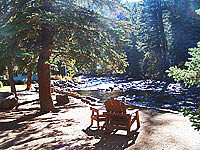 Streamside is one of the Rocky Mountains most unique resorts. Secluded and private luxury cabin-suites on 17 acres along the Fall River. Relax in you own private hot tub on your deck nestled in the trees overlooking the river or cozy up inside by the custom gas log fireplace and enjoy the peaceful tranquility of our quiet mountain resort. Our property also features an indoor Swim Spa for your pleasure. 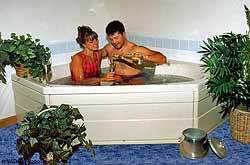 One-third is a hot tub and the remaining two-thirds measures 20 x 8 and has three swim-against jets for treadmill swimming or water aerobics. All cabin-suites have TV/HBO, VCR’s and we offer a video library complimentary for our guests. Special packages are available for that unforgettable romantic honeymoon in the Rocky Mountains. 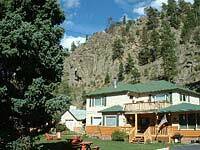 Nestled in the trees and rock outcroppings on 8 1/2 acres Sunnyside Knoll Resort is not only one of the most picturesque resorts in Estes Park but is also the most unique, offering superb wildlife viewing. We are ideally located, just minutes from the Fall River entrance to Rocky Mountain National Park and a little under a mile from downtown Estes Park. We offer motel units, spa suites�both standard and deluxe�and cabins, with or without private hot tubs. All accommodations have gas or woodburning fireplaces and most have kitchens or kitchenettes. Guests welcome. Come�kick back�relax and enjoy! Come and enjoy a bit of heaven! Located along Fall River, Aspen Winds provides you the opportunity to experience the splendor of the Rockies. No matter the season, you'll feel at home at Bear Paw Suites. On Fall River. 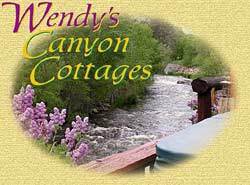 Estes Park Vacation Cabins and Bed & Breakfast Inn in Heart of the Rocky Mountains!! Beautiful mountain cabins with continantal divide views! 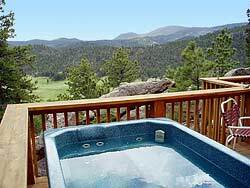 Hiking, fishing and wildlife watching nearby, or relax in your hot tub. 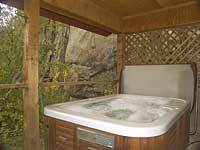 Couples cabins with private hot tubs...Comfy, Cozy and Romantic! Private mountain cabins. All fully equipped and many come with Hot Tubs, WiFi, Views & Peaceful Seclusion. Pets welcome in some. Private outdoor hot tubs, mountain resort with riverfront property and no children! Can it get any better? Romance is a click away. No matter the season, you'll feel at home at River Stone where Fall River is just out your patio door. 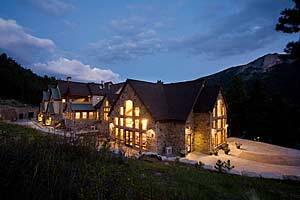 Looking for mountain charm with upscale comfort? Quiet, tranquil, secluded… let us help you customize your Romantic Get-A-Way. 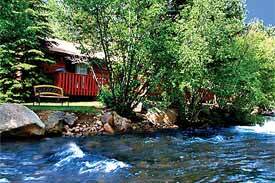 Romantic cabins await on our scenic 45 acre resort near Estes Park and Boulder. Some with jetted tubs and fireplaces. We do Weddings, Honeymoons and Romance packages too! Private and secluded cabin-suites nestled along the Fall River on 17 wooded acres with an abundance of wildlife and fishing . Cabins with spas or private hot tubs,nestled in the trees and rock formations,on 8 1/2 acres. Superb wildlife viewing. ...On the Edge of Wilderness! Rustic to luxury cabins on 15 acres next to Rocky Mountain National Park. Jacuzzi, hot tubs and fireplaces available. A Romantic Getaway in an newly remodeled 1910 mountain home. Breathtaking views from our distinctive vacation homes and condominiums.